PHE Screening has launched new training resources to support staff providing primary HPV screening in the NHS Cervical Screening Programme (CSP). We have developed these resources to meet the requirements set out in the new guidance for local cervical screening providers on implementing high-risk (hr) HPV testing. Sample takers working in the NHS CSP play an important role in making sure women understand hrHPV testing and the possible results of their screening test. 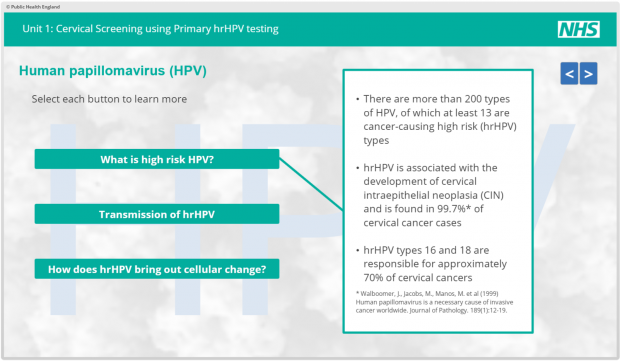 We have developed a national e-learning module on primary hrHPV testing for sample takers that we recommend all sample takers should complete. This module may also be useful for colposcopy nurses because women often have questions about hrHPV testing on attendance at colposcopy. We have also developed a module for all colposcopists and nurse colposcopists who receive primary hrHPV screening referrals. We developed this training in collaboration with members of the British Society for Colposcopy and Cervical Pathology and it draws on experience from the primary HPV pilot sites. Both e-learning modules take about 20 minutes to complete and a certificate of completion is generated automatically when finished. See short promotional video below. The modules are hosted on the Health Education England e-learning for Healthcare website and are part of a suite of e-learning materials for staff working in NHS screening programmes. There are 2 ways to sign up and access e-LfH. Read our blog about which way is best for you. Staff involved in the screening and reporting of cervical cytology samples will need an up-to-date knowledge of the primary HPV screening pathway. A training framework has been developed to help support and maintain their skills and competence. Programme-approved pathology and cytology screening education and training centres will provide this training. To ensure access to this training is as flexible as possible, it can be made available to all staff as part of a programme update or as a refresher for important staff who want to cascade training in-house. Staff working in laboratories that have already converted to primary HPV screening can attend this training to refresh their knowledge and make sure they are up to date with the latest guidance. Cervical screening provider leads (CSPLs) are responsible for the quality and effectiveness of local cervical screening services. They are vital in making sure local services provide the best service and outcomes for women. The reconfiguration of screening laboratory services associated with the implementation of primary HPV screening will impact significantly on the role of CSPLs. Training for this role is based on the national guidance on the role of the cervical screening provider lead and it is recommended that new CSPLs and those needing further development attend programme-approved training. To discuss your training needs and requests, please contact the programme-approved pathology and cytology screening education and training centres.